December 3, the International Day of Persons with Disabilities, marks the start of a worldwide event to raise awareness for accessibility. For millions of people with wheelchairs, walking aids or baby carriages the most common obstacles which limit their freedom of movement are stairs. With their campaign “MapMyDay”, the German NGO Sozialhelden e.V. and the World Health Organization (WHO) want to call attention to barriers and promote accessibility worldwide. The “MapMyDay” campaign calls upon people everywhere to mark public places in their neighborhoods, near their workplaces and during their daily routines, using Wheelmap.org, the online map for wheelchair accessible places. The campaign not only addresses people with a disability. It is really easy for everybody to contribute to the map by adding new local information with a few clicks. In this way users have already rated nearly 600,000 public places, making the map the world’s largest database for wheelchair accessibility. Wheelmap is available as an app for iPhone, Android Smartphone and Windows Phone (Windows 10), as well as on the website www.wheelmap.org/en/map – in more than 20 languages. 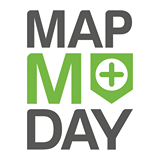 Participants can be part of “MapMyDay” individually or in groups, with colleagues, teammates or friends and family. With the launch of the campaign website www.mapmyday.org news of this campaign will be spread across the different sectors of society in order to reach as many people as possible. NGOs, government authorities, businesses, schools, associations and celebrities are invited to help spread the word to their networks and ideally, to organize local mapping events themselves.